Imagine a major television network promoting an evangelical organization keen to convert the entire country, all in the name of preventing hate against a religion. For the USA Network, fighting Islamophobia means promoting WhyIslam, the "project" of the Islamic Circle of North America (ICNA), dedicated to spreading the group's take on Islam among all non-Muslims. USA Network, a division of NBC Universal, ran the ad in April about religious intolerance, a real problem in America, and linked its campaign to WhyIslam. "American Muslims are victimized everyday because of misinformation about their religion," the ad said. 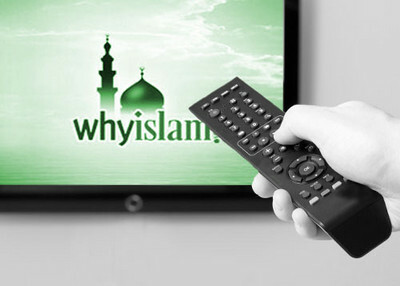 "Get authentic information about Islam by calling 1-877-WhyIslam or visit whyislam.org." A USA Network spokesman did not respond to a request for comment for this article. The ad features actor Matt Bomer of USA Network's "White Collar" program offering a general, feel-good statement about tolerance. "Lately it seems that religious intolerance has been growing," he says. "And while we can disagree about the past and we can argue about the future, we're all here now. Together. And together we all have the same basic right to hold and practice our own beliefs." A voiceover then tells viewers that "American Muslims are victimized every day because of misinformation about the religion." The web address for whyislam.org appears on the screen, along with a toll-free number to contact ICNA for more information. The ad is part of the network's "Characters Unite" campaign against bigotry. According to an ICNA statement, the group teamed up with the network to show the ad on 130 times on USA and other networks including A&E, AMC, Animal Planet, CNN, Planet Green, Hallmark, History, Headlines Network, MSNBC, National Geographic, Oprah Winfrey Network, Travel Channel and the Weather Channel. Rather than promote an understanding and tolerance of Islam, however, WhyIslam tells its audience that Islam is the only way. "Islam, as a way of life, is the solution to all problems of the human race, and is the only hope for the present as well as the future," the group says in one pamphlet, "Islam Explained," that is regularly handed out from WhyIslam tables and booths across the country. While WhyIslam may not be the only religious group, Muslim or otherwise, that promotes its religion as the one true way for mankind, its parent organization has had a long history of promoting Islam as a replacement to democracy. According to its Charter and By-Laws, ICNA is pursuing the "Establishment of the Religion" [Iqamat ud-Deen] in all areas of human life. "This Deen [religion] encompasses the internal, external, individual and collective aspects of the human life whether it pertains to beliefs, rituals and morals or to economic, social or political spheres," it says. "Iqamat [Establishment] of this Deen [religion] implies that this Deen should be sincerely and exclusively implemented in all aspects of human life." Accordingly, the Charter that the "ideal and best practical model" for establishing Islam around the world is the caliphate, the theocracy "established by the Prophet Muhammad and the rightly-guided Caliphs." In another article on the WhyIslam webpage, "Voices of Muslim Women," the group explains that its conversion efforts are meant to create an Islamic society. "Why are Americans turning from Christianity to Islam? Americans need to look past the stereotypes and look to the real Islam, the Islam of peace, the Islam which is getting more and more followers every day," one woman claims in her testimonial. "Getting an Islamic society, to me, doesn't mean being fanatical or militant. It means having a society where the members are following the moral codes that Allah gave to us, as well as the religious obligations and social laws. Islam governs all of our lives. It is for all time, for all peoples. If Americans looked closely at Islam and realized that, then Islam would at last be understood." The group's webpage also explains the social order it seeks, quoting from Abul Ala Maududi, the founder of the extremist South Asian group Jamaat-e-Islami. "Islam says that if there is any real difference between man and man it cannot be one of race, color, country or language, but of ideas, beliefs and principles," Maududi declares. "On the basis of this fundamental tenet, Islam seeks to build a principled and ideological society very different from the racial, nationalistic and parochial societies existing in the world today." However, leaders of Jamaat-e-Islami have also followed Maududi's path of jihad as the only way to solve the nationalist battle with India over the disputed Kashmir province. Implementing Sharia law, both the personal law and at the societal level, are emphasized. "Complete with divinely-ordained laws, a blueprint for societal balance, and individual and mutual sense of accountability, this 'way of life' called Islam was presented to the general public through the medium of the Prophet Muhammad, peace be upon him," the article "Islamic Shariah" reads. It goes on to compare 'common' law and Islamic law, explaining that "Shariah has its roots in the divine writ," and that "Shariah encompasses all areas of life, such as dietary laws, dress code, finances, and social aspects. On the other hand, common law leaves matters such as dietary considerations, relationships between consenting adults, dress code, and economic choices to the preferences of individuals." The website also defends polygamy as a preferable option to Western society's infidelity. "Let us consider a few honest questions: What is the situation in countries that have banned polygamy? Do they really enjoy sincere and faithful "monogamy" as the norm," asks the group's "FAQ" on Islam. "Are infidelity and secret extramarital sexual relationships more moral than the legitimate, legally protected husband-wife relationships, even under polygamy if there is a pressing need for it? Which of the two situations is better," it questions in the section, "Polygony (sic) is a Solution." WhyIslam's dawah, or proselytizing, is closely linked to its parent group's desire for the "Establishment of the Religion" in the United States. "These words [Establishment of the Religion] include not only practicing the religion in individual and collective life and propagating its true teaching to others, but also striving to make this Deen [religion] a way of life for all," the 2010 ICNA Member's Hand Book reads. ICNA educates its members that while the process of converting Americans primarily is not violent; it does culminate in an Islamic state in America. ICNA excerpted a section from Abul Ala Maududi's book "Witness Unto Mankind," for its 2004 Tarbeyah [education] Guide, describing the permanent conflict between Islam and the West. As Islam rises, "the leaders of secularism will lose all credibility and authority," until all other ideologies are replaced. "Their philosophy and world-view, their economic and political ideologies, will prove fake and spurious when confronted by your truth and right conduct. The forces that today belong to the secular camp will, one by one, break away and join the camp of Islam." "Muslim effort to refute erroneous ideas, be it relating to belief, social ideals, political theory or economic policies. So then, Islam is political as much as it is religious. Interesting. The words of President Barack Obama were ensued by celebrations in towns and cities across America, where the young and old were shedding tears of joy, amidst jubilation in the realisation that the figurehead who represented resistance to Western imperialism was killed by an elite force from the U.S Navy Seals. The description of the killing would please the imagination of many patriotic Americans as the account reminisces a scene one would watch in a Delta Force movie - the best trained commandos executing a dangerous mission in a slick, spectacular fashion - something that will go down in the future edition of US Navy SEAL Combat manual. After the Hollywood-style operation drew to a close and the nonsensical narrative began, one finds an array of contradictory and conflicting media reports about the finer details prior to his assassination. Such inconsistencies add to the fuel of speculation about the exact nature of the event and even the killing itself. One account speaks of the presence of human shields that has subsequently been retracted and another report implies how Bin Laden resisted but the latest update states that he was unarmed and exhibited no willingness to fight. Following this piece of journalistic 'accuracy', another absurd claim states that he was buried at sea following a ghusl and Jannaza prayer! Which sea was he buried in? Either the Indian Ocean or the North Arabian Sea! The U.S Secretary of State, Hilary Clinton, voiced her thoughts and gave a message to the Muslim World stating that Bin Laden's death came at a time when people in the Middle East and North Africa were rejecting the 'extremist narrative' and were standing up for freedom and democracy. Such comments are typical of those whom espouse the Capitalist mindset where a particular event can be capitalized in order to sway the masses in a certain direction in order to maintain the status quo of subjugation and oppression. It appears that her comments are a desperate attempt to set the trajectory of the Muslim World in line with the aspirations of the secular West as a way of continuously exploiting the rich resources and securing strategic interests for the Western powers. It's a far cry to assume that the Muslim World does not wish to see the implementation of an Islamic political system upon her land. More and more of the Muslim population is placing greater hope and confidence in the Islamic model to govern life affairs and it is only a matter of time when both democrat and dictator will write their last pages in history before a new leaf is turned. The conflict between Haqq and Baatil has always been the central dimension of the human condition and existence. One only needs to ponder on the dialogues between Syedinna Ibrahim (AS) and Nimrod, Syedinna Musa (AS) and Firawn or our Nabi Muhammad صلى الله عليه وسلم and Abu Jahl. It then becomes all too apparent that the conflicts can take many forms but remain constant in their essence. The fact that man-made systems and ideas are governing the earthly world requires a united Muslim effort to refute erroneous ideas, be it relating to belief, social ideals, political theory or economic policies. Therefore, the battle of ideas will still continue between Capitalism and Islam, so our struggle to eliminate the colonialist influence from our lands will proceed unabated. This struggle will haste forward despite the distractions and oppression that is bestowed upon this Ummah. This struggle will continue to be political in nature until, and even after, the Khilafah Rashidah takes its resting place. "Rather We hurl the truth against falsehood and it cuts right through it and it vanishes clean away!"